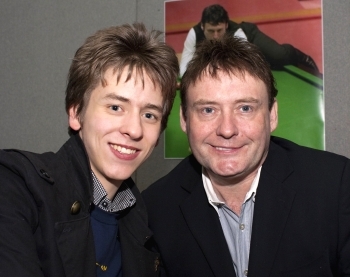 I met the snooker player Jimmy White when I was at the Collectormania event held in London's Olympia in November 2010. He signed a photograph for me and then I had this photo taken with him. the English Amateur Championship in 1979, and in 1980 became the youngest-ever winner the World Amateur Snooker Championship when he was only 18. White established himself as a top professional in 1981, and for the past thirty years, has played consistently at the highest level. The World Championship title has, however, eluded him although he has reached the final at Sheffield's legendary Crucible Theatre on no less than six occasions! player never to have won the world championship but I've won 10 ranking tournaments and 27 invitational tournaments". maximum break at the World Snooker Championships - he did this against Tony Drago in 1992. He is left-handed, and has compiled more than 255 competitive century breaks during his career. In his heyday, as well as being a brilliant snooker player, White was also a hardened drinker and gambler. He reckons that he has blown at least £1 million gambling and around £500,000 on drink during his professional career.. 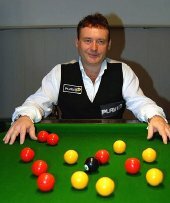 Although best known for his snooker, Jimmy White is also a top pool player. 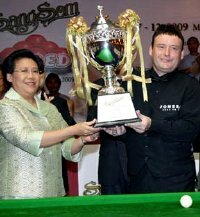 Along with Steve Davis and Alex Higgins, White was a member of Europe's victorious Mosconi Cup team of 1995. Click here for Jimmy's career highlights. White's bull terrier, Splinter, was stolen, held for ransom and became the first dog to have a colour poster on the front page of The Times! Splinter was returned after White paid out to get him back. Jimmy White had a cameo film role as himself in Legend of the Dragon (1990) and in the film Jack Said (2009) he played the part of Vic Lee, a dodgy snooker club owner. In November 2009, White appeared in the 9th series of ITV's I'm a Celebrity... Get Me Out of Here! He finished in third with the chef Gino D'Acampo winning. White is also a good poker player, winning the second Poker Million tournament in 2003. He is a keen supporter of Chelsea Football Club. White's Whirlwind Snooker, and Jimmy White's Cueball World. unofficial biography written by a die-hard fan Aubrey Malone, appeared in 2009. In August 2010, White was one of the pallbearers at the funeral of Alex Higgins. The two, who were both addicted to drink and gambling, had been friends during their playing days. 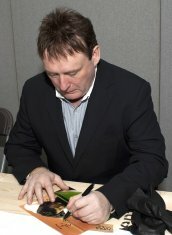 Jimmy White, married his wife Maureen in 1980 (they are now divorced), and they had five children, Lauren, Ashleigh, Georgia, Breeze and Tommy. 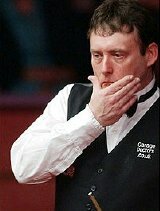 In 1999, Jimmy White was awarded the MBE for services to snooker.